All the wooden power poles in California have a design flaw similar to how attic roof ventilation does. Both can become wild fire resilient, if we can only get the proper authorities to understand and enforce changes that support less loss to fire. Until realized, any government funding is a huge sink hole of wasteful spending. 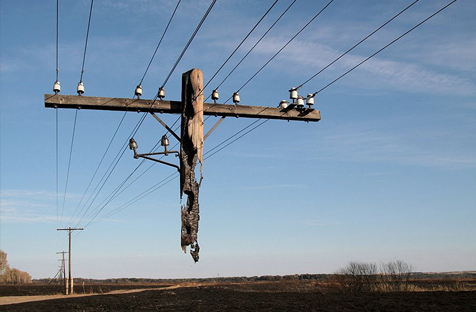 Believe it or not, power poles are only treated for termites, when they could easily have also been treated for fire with FRT (Fire Retardant Timber). The responsibility should be the asset holders to make all those unprotected poles fire resilient now. All the homes in the western wild fire regions are being consumed by hot micro embers driven by wind, because the rat screens for ventilation on home soffits allow embers into the combustible space much too easily. Both, Power Poles and Attic Vents can be retro-fitted now by M-Fire. Until both become wild fire resilient, we are going to continue to rack up historical losses and neither should be insurable until this takes place. We can no longer support this sinkhole of wild fire losses when resilient technology is readily available. Almost 10 years after wildfires ravaged San Diego’s backcountry, killing three people and destroying more than 2,500 homes and outbuildings, two judges have rejected San Diego Gas & Electric’s request to bill customers $379 million for the costs of three fires sparked by utility lines.